Transcript of audio, notes on the audio, and additional information follow below. All Web addresses mentioned were functional as of 10-9-15. From the Cumberland Gap to the Atlantic Ocean, this is Virginia Water Radio for the week of October 12, 2015. This week, we repeat an episode from October 2014, featuring music about an annual turning point that inspires humans but shuts down trees. Have a listen for about 40 seconds. “Colors” and “Four Seasons: Autumn Songs” are copyright by John McCutcheon/Appalsongs and Si Kahn/Joe Hill Music, used with permission of Appalseed Productions. More information about John McCutcheon is available from his Web site, http://www.folkmusic.com/. This week’s episode replaces Episode 234, 10-6-14. Black Gum twig showing bud above a crescent-shaped leaf scar; the leaf scar contains three white bundle scars. Photo by John Seiler, Virginia Tech Department of Forest Resources and Conservation; used with permission. 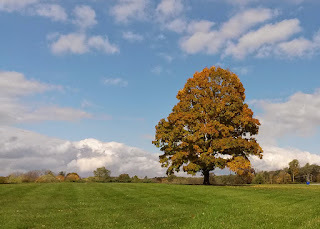 Sugar Maple in early stages of changing colors in Blacksburg, Va., October 5, 2014. 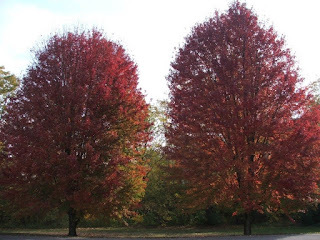 Twin Red Maples in full autumn color at Bissett Park in Radford, Va., October 18, 2011. Sugar Maple in Blacksburg, Va., October 21, 2014. J.R. Seiler, J.W. Groninger, and J.A. Peterson, Forest Biology Textbook (compact disk), Virginia Tech Department of Forest Resources and Conservation, Blacksburg, 2008, online at http://dendro.cnre.vt.edu/forestbiology/syllabus3.htm. “Why Leaves Change Color,” U.S. Forest Service/Northeastern Area, online at http://www.na.fs.fed.us/fhp/pubs/leaves/leaves.shtm. “Virginia Tech Dendrology Tools,” online at http://dendro.cnre.vt.edu/dendrology/tools.htm. 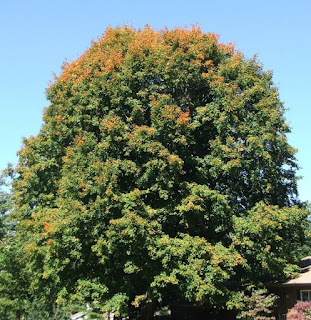 This Web site, part of the dendrology course by Dr. John Seiler in Virginia Tech's Department of Forest Resources and Environmental Conservation, offers identification keys and fact sheets to trees and other woody plants throughout North America. Jacob Demmitt, “Professor's leaf peeping is down to a science,” Roanoke Times, 10/18/14. This article discusses details of fall colors in tree leaves with John Seiler, Virginia Tech Department of Forest Resources and Environmental Conservation. The article is available online at http://www.roanoke.com/news/local/blacksburg/virginia-tech-professor-has-leaf-peeping-down-to-a-science/article_b3c9127b-6594-50cc-9e4c-856b007bd755.html. Sanglin Lee and Alan Raflo, “An Introduction to Trees in Virginia and Their Connections to Water,” Virginia Water Resources Research Center, December 2011; available online from from the Virginia Water Central News Grouper, at http://vawatercentralnewsgrouper.wordpress.com/2011/12/07/an-introduction-to-trees-in-virginia-and-their-connections-to-water/. Sycamores: Episode 176, 8/26/13, featuring “Sycamore Rapids” by Timothy Seaman. Please also see the “Plants” category at the Virginia Water Radio Index link above (http://www.virginiawaterradio.org/p/index.html). K.10 – Changes in natural and human-made things over time. K.7 – basis needs and processes of plants and animals. LS.6 - ecosystem interactions, including the water cycle, other cycles, and energy flow. LS.9 - adaptations for particular ecosystems’ biotic and abiotic factors.